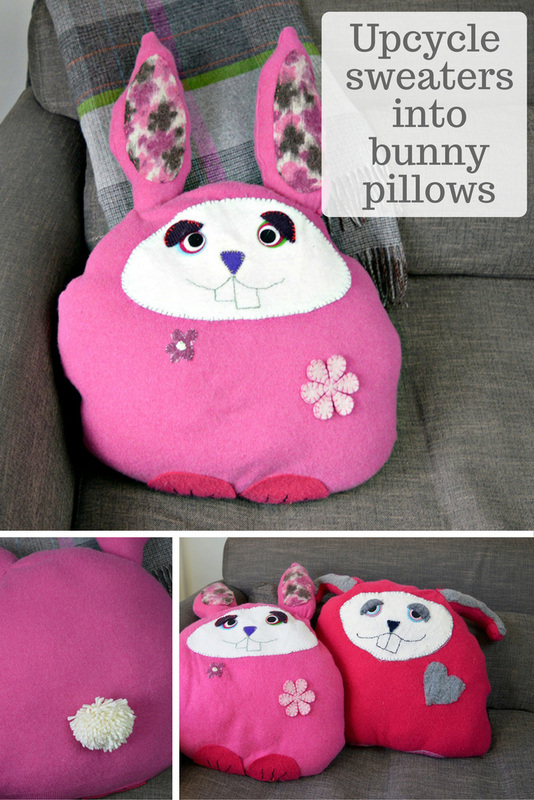 Bunny Pillows: It definately feels like spring now, so I thought I’d make some fun pillows/cushions to celebrate the new season. In my large stash of old woolen sweaters I had a few lovely soft pink cashmere ones, perfect to turn into a cute bunny pillow. 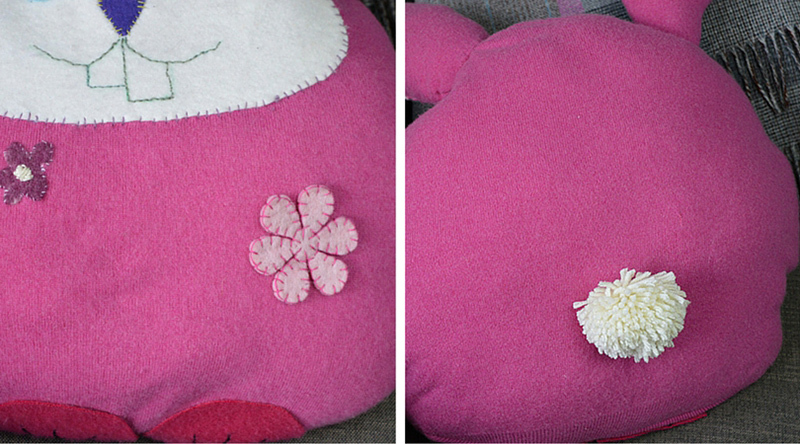 These pillows are really quite simple to make, they also add a bit of spring fun to the sofa. Not sure my friends cat is too impressed though ! 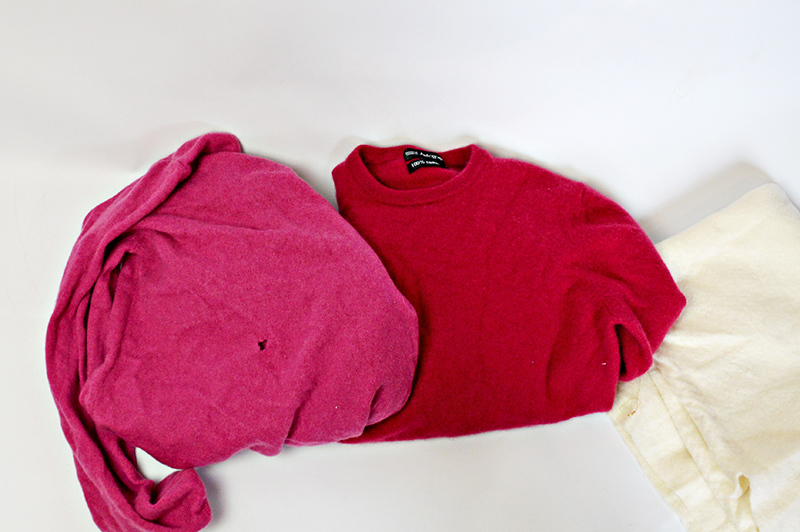 Old wool sweaters – Felt them in a hot wash like I did with my mountain cushions /pillows. Scrap coloured pieces of felt for the eyes and face. 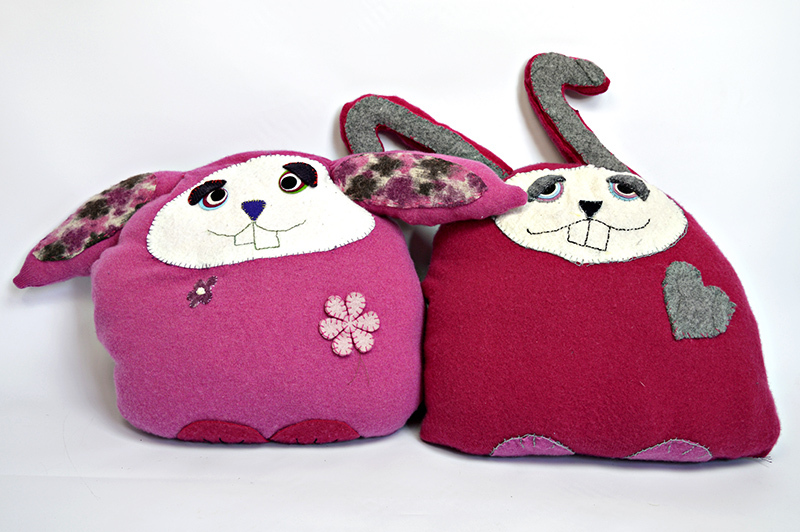 Fiber stuffing – I use old pillows. Large piece of paper for template. Scissors, fabric glue, pins, needle and thread. One sweater will be enough per cushion. 1. Lay your sweater out flat and place your paper on top to make a template. Draw out a pattern on the paper that will allow you to make as big a cushion as possible. Whilst the paper is pinned to the sweater draw the face and feet on to paper. 2. Cut out your cushion shape from the sweater, keeping the sleeves to one side. Cut out a bunny shaped ear from each sleeve. 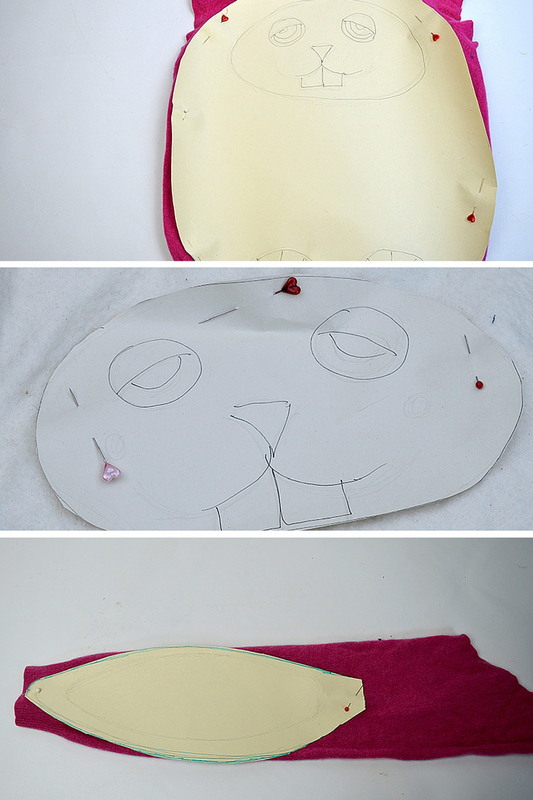 3.Cut out the felt for the face using the paper template. Before sewing up the sides of the bunny body and ears you need to make the face. 4. For the eyes cut out 4 circles decreasing in size for each eye in a variety of colours. Cut out 2 felt eyelids these are half circles slightly bigger than your largest circle. Using fabric glue stick the circles on top of one another in size order with eyelid on top. 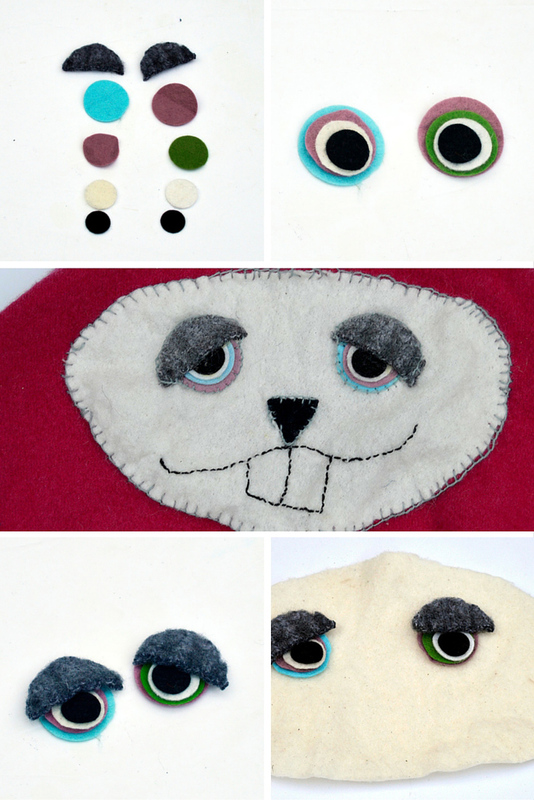 Then sew these onto your felt facepiece. Use any stitch you prefer. I used a blanket stitch whereas my friend Wendy just used a random stitch. It is nice to use an embroidery thread in a contrasting colour and make the stitch a feature. 5. 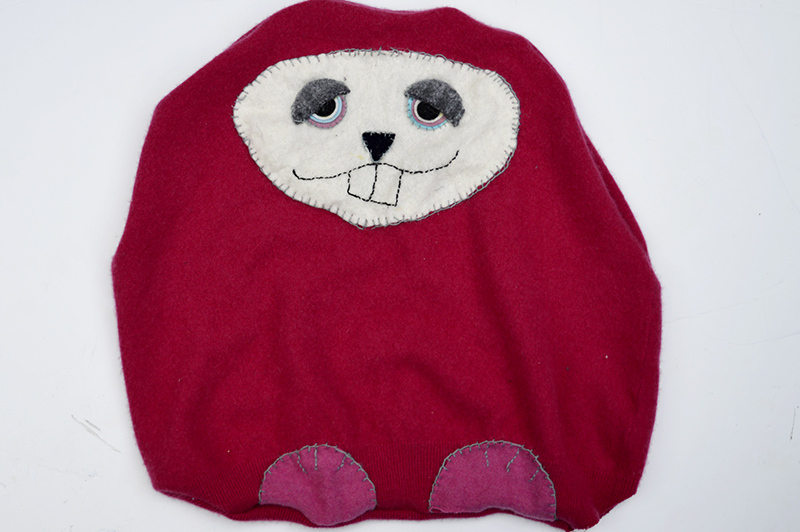 Cut a small triangle of felt for the nose, and the embroider the mouth and teeth. 6. When the face is finished, stitch this to the front of your sweater using your prefered stitch. 7. Turn your sweater body and ears inside out and stitch up leaving a small hole to stuff it. Turn them the right sides out and stuff with fiber filling and sew the holes shut. Sew the ears to the body. 8. 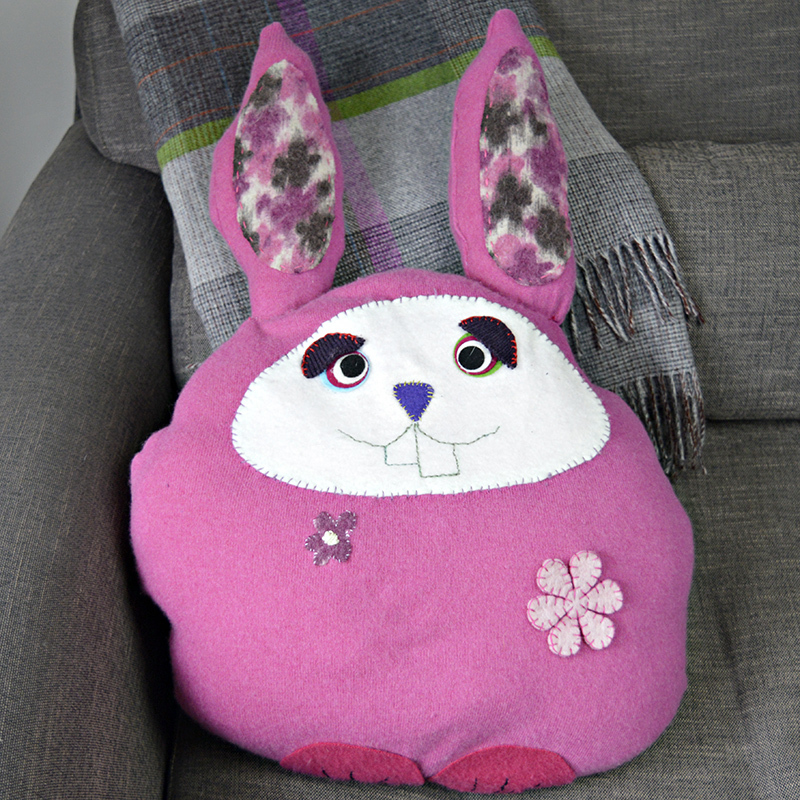 To give your bunny cushion more character, you can add some embellishments. Such as inners in a contrasting fabric for the ears & feet pads. Felt flowers and hearts are great for hiding any holes in your jumper and some extra interest. 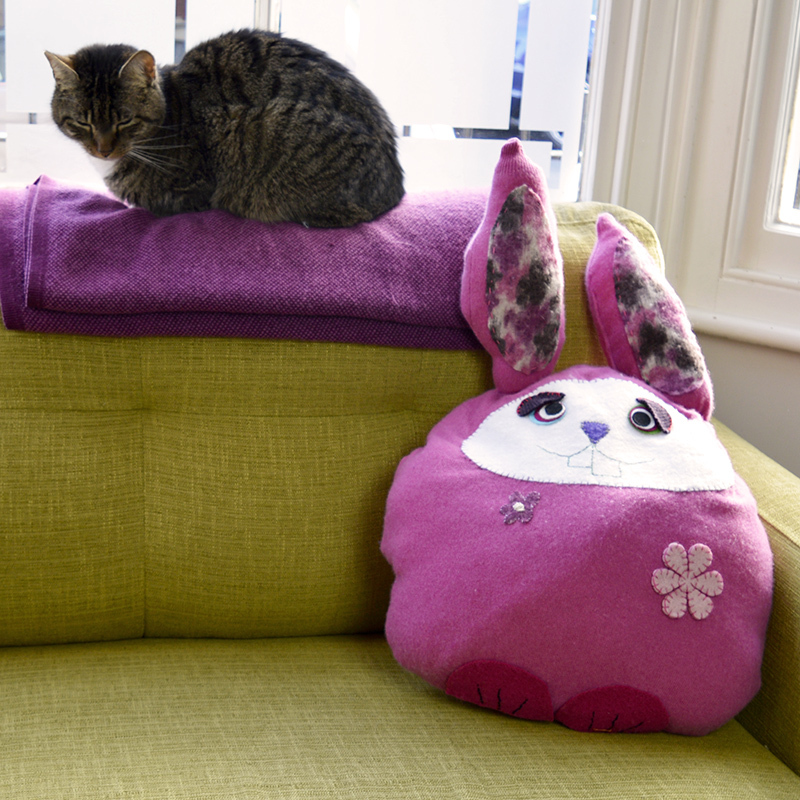 Hopefully the cat will eventually grow to love the bunny cushion ! I adore these pillows. I will be looking for some wool sweaters in my travels around the thrift stores so I can try to make one or two. Pinned. Thank you, and good luck with h your sweater hunt. Your friend’s cat is crazy! This looks like the most snuggable pillow ever! Thanks for linking up!!! Thank you, the cat certainly has personality. Loving your blog and exploring it more. My three year old would love that pillow. Thanks for linking up at Family Joy Blog Link Up this week. Thank you very much and glad you liked it. Ha! These pillows have so much character. Thank you for sharing at the Celebrate Your Story Link Up Party. Thank you very much and I forward to seeing them. Fantastic! So cute. I believe that my daughter will love it. Thank you ! I’m sure she will. Very cute! Good find on those bright sweater colors. Thank you ! My mum and my Aunt pass all there old sweaters on to me. How adorable are these and those faces are too cute! Thank you for sharing this at Celebrate Your Story link party and have a Happy Easter! Thank you, we had fun making the faces. These are adorable! I think it’s the faces that make them. So cute. Thank you ! We had fun designing the faces. I love making things out of old felted jumpers! 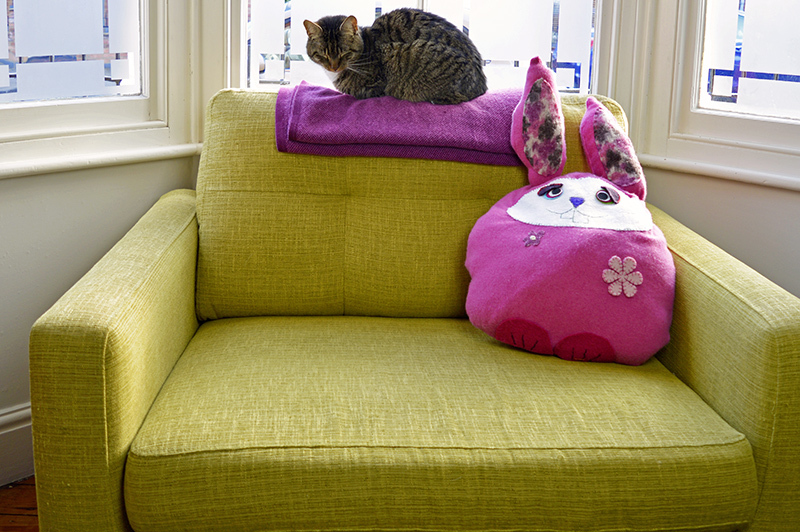 Your cushions look great, I bet they are cosy to snuggle up to. Thank you, they are lovely and soft.